* It's own unique matte cover art. 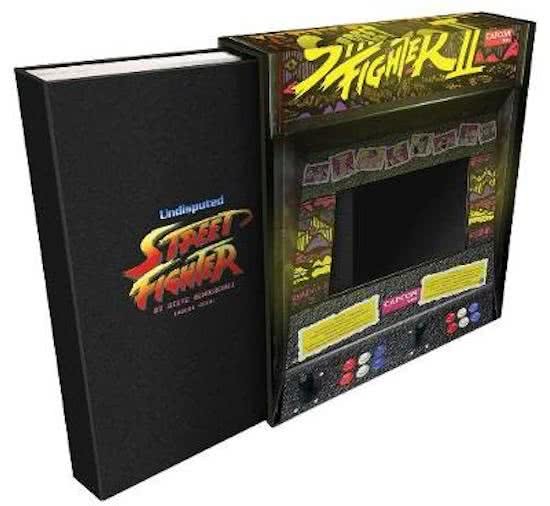 * Your book will fit effortlessly into glossy, die-cut slipcase designed to resemble your favorite arcade game. * A high quality folded sleeve will contain o 3 Street Fighter Art Prints (details to follow) o 1 Papercraft folded model (details to follow) Since its inception 30 years ago, the Street Fighter (TM) video game series from Capcom has thrived based on a lethal combination of innovation, style and technique. From first-of-their-kind advances such as selectable characters and secret combo moves, to imagination-capturing characters such as Ryu, Chun-Li, and Akuma, Street Fighter has stayed a step ahead of the competition en route to becoming one of the most enduring and influential franchises in video game history. Undisputed Street Fighter (TM) features in-depth interviews and exclusive, behind-the-scenes looks into the making of the Street Fighter games, and the iconic art, design, and imagery from across the Street Fighter universe.